Looking for a hearty meal for a cold winter's evening? These two recipes from the New Covent Garden Soup Co. are bursting with flavour and are perfect for your Burns Night supper. Get stuck in! 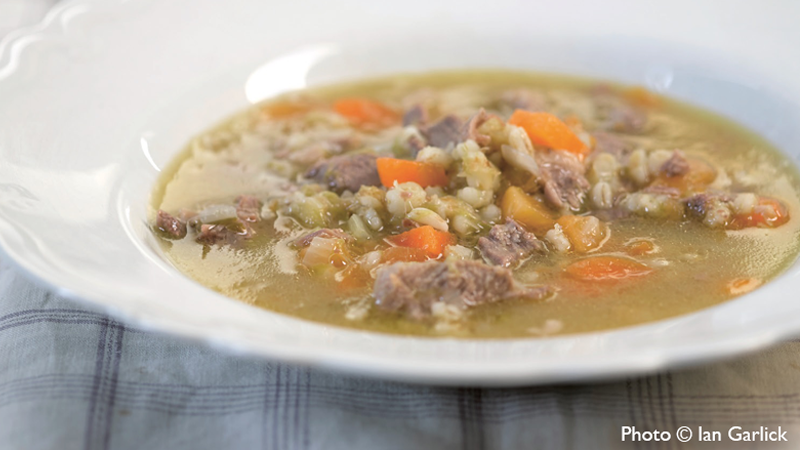 This brilliant and quintessentially Scottish soup has been a family recipe for many years, handed down through the generations. It still makes a regular appearance at the table for Lesley Loveday’s mum. Lesley, our marketing guru, suggests making it with different cuts of meat; it also tastes great with a shin of beef. This broth makes an excellent main-course meal, especially when served with warm, crusty bread. Place the lamb in a large saucepan, cover with the water and bring to the boil. Add the carrots, onions, leek and turnip to the pan. A froth might form on the surface of the water – skim this off every so often. Cook for 15 minutes. Rinse the barley and add it to the pan, together with the parsley, clove, bay leaf, salt and pepper. Simmer until the barley is soft and the soup has become thick in consistency, about 50 minutes. Stir the soup as it cooks and skim off any fat with a large spoon. Remove the lamb 15 minutes from the end of cooking and allow it cool a little before stripping the meat from the bones. Discard the bones. Cut the meat into small pieces and return to the soup. The final broth should be thick enough to stand a spoon up in. Remove the clove and bay before serving. combined with the spice of haggis. We suspect this recipe will be one you’ll return to year after year. Heat the oil in a large saucepan and sauté the onion, carrots and garlic for 10 minutes. Add the whisky and cook for a further 5 minutes. Add the swede, the potatoes, the red lentils and the pearl barley to the pan. Stir, then add the stock and simmer for about 40 minutes, until the lentils have broken down and all the vegetables are cooked and starting to break up. Add the haggis, the parsley and salt. Bring the soup up to a simmer. The haggis will break down a little, thickening the soup. Add a touch of pepper, if you like, before serving. Recipes taken from New Covent Garden Soup Co. Great British Soups, available now.